If you’ve been living with the embarrassment of noticeable dental problems, you’re not alone. Many people suffer with cosmetic and structural tooth damage. But there’s good news! Drs. Smith and Robinson have an arsenal of tooth restoration techniques to correct tooth decay, chipped or fractured teeth, mal-alignment, tooth stains resistant to treatment and other dental damage. If you live in Lexington, Irmo or Columbia, SC, your dentist will consider several factors when deciding which procedures are right for you. If you have tooth decay, your dentist will examine your teeth to determine the severity. 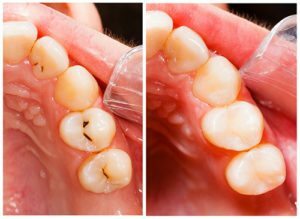 When the damage is extensive, decay may have reached the roots of the teeth resulting in large areas of unsupported tooth structure. In this case, you may be a good candidate for an indirect tooth restoration. While smaller, confined areas of damage can be corrected with direct restoration. A direct tooth restoration can be completed in just one office visit. It’s a process whereby small amounts of damaged tooth structure are replaced with composite resins. Direct restorations are successfully performed daily in our Lexington, SC dentist office to fill cavities and correct other localized problems. An indirect tooth restoration is indicated when there isn’t enough supportive tooth structure to properly restore the tooth. In this case, Drs. Smith and Robinson will carefully plan out the materials and methods required to correct the situation. A crown or onlay restoration is then manufactured in a laboratory and placed at a subsequent appointment. Dental cavities are caused by bacteria, acidic and high sugar diet, poor oral hygiene and an individual’s own susceptibility to tooth decay. If left untreated, decay will spread and cause structural problems that require more complex procedures. Composite resin fillings for cavities can be done at a Columbia, SC dentist appointment, typically in one visit. Ceramic and porcelain fillings are more durable and longer lasting than composite resin and require two appointments to be created and placed. A crown is an indirect tooth restoration that completely covers an unstable tooth (i.e. one that is too damaged for a filling to properly correct). It gives the tooth back its healthy color and function. Some crowns can be made of a metal substructure covered with a porcelain coating, while others are fully ceramic. Drs. Smith and Robinson can help you determine the best material for your condition. A bridge is simply the term for when one or more crowns are splinted together to cover and replace multiple damaged teeth. Bridges can help restore your smile and proper chewing function. A dental implant is designed to replace a tooth too damaged to be saved. An implant is used to replace the entire structure of the tooth, including the root. The technique utilizes a titanium fixture surgically placed into your jawbone, which replicates the function of a tooth’s root. Once the jawbone and the fixture are fused together, a replacement tooth is attached. Dental implants have little to no impact on adjacent teeth, and they are vital in preventing jawbone erosion and impaired chewing that can lead to poor nutrition. Teeth whitening (bleaching) can be performed at home or, for those seeking immediate results, in our Lexington, SC dental office. Drs. Smith and Robinson will recommend the appropriate concentration of bleach strength, depending on the level of your discoloration, and your personal preferences for the amount of time you will wear the trays. If you’re considering tooth restoration and need more information, contact Drs. Smith and Robinson. We provide dental careincluding restoration services to residents in the Lexington, Irmo, Columbia and surrounding areas and can help you decide on the right treatment for your needs.